While you’re figuring out the do’s and don’ts of what you should eat while expecting and especially all those foods to avoid during pregnancy, it’s easy to forget that you’ll often feel too tired to get busy in the kitchen – especially during your exhausting first and final trimesters. It goes without saying that there´s never been a better time to eat well and cook from scratch. These healthy recipes offer all the nutrition you could want for you and your growing baby, but won’t have you slaving away for too long. 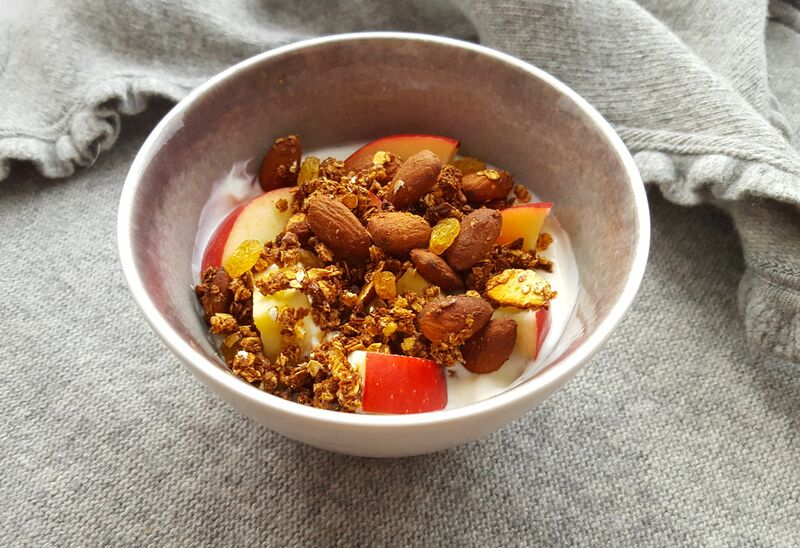 Start the day off right with this wholesome granola, which flirts with the flavors of traditional Dutch apple pie but is actually good for you and baby. It's made with oats, almonds, and flaxseed and happens to be free of gluten, lactose, and refined sugars. With decent granola demanding prices upwards of $4 these days, think of all the money you'll save that can better be used for the baby room. This ginger-spiced chili-spiked salad is just what you and baby need for lunch right now. It is a rich source of one of the most important nutrients required during pregnancy - iron - as well as the vitamin C needed to absorb it. Our tip for tired moms-to-be? Double up on the pumpkin for a head-start on tomorrow's lunch or dinner (think Pumpkin Risotto or Pumpkin and Sage Pasta, for example). This terrific appetizer recipe evokes all the fresh, zesty flavor of a true tartare (traditionally raw, finely chopped seafood or meat), which pregnant women may not consume for obvious health and safety reasons. The prawns are pan-seared and then flavored with herbs and sweet-and-sour pickles and spread on garlic-rubbed toast. You'll want to cook this while pregnant and teach your partner how to make it while you're recovering from delivery. It's easy, adaptable, delicious and nutritious. This recipe uses carrots and parsnips, but other great root vegetables to try are potatoes, carrots, celeriac, and beets. Oven-roasting brings out the natural sugars in the vegetables, giving them a sweet, caramelized taste without any added sugar and with very little fat. What's more, the oven does all the slaving for you! Serve it as a side, or simply top with your favorite crumbly cheese. There is a way to still enjoy succulent meat dishes now that rare beef, lamb, and duck are off the menu: simply go for stews that cook it low and slow. Don't let the 3-hour cooking time scare you off: this Indonesian-inspired pork and soy sauce stew couldn't be any easier. There's very little preparation here, so let the pot do all the work while you go and put your feet up! Our easy entertaining secret, poussin – essentially just fancy roast chicken – is the simplest way to feed guests during your pregnancy, no fancy footwork or carving required! The baby chickens are brushed with a mouth-watering Moroccan marinade of cilantro, garlic, lemon, caraway seeds, paprika and cayenne pepper before being roasted in the oven. Filled with folate, an essential B vitamin that can help prevent certain types of birth defects, particularly neural tube defects (NTD), like spina bifida and anencephaly, this traditional Dutch bean soup is well worth adding to your pregnancy repertoire. Many pregnant women crave fresh, cool, sour flavors, and this Super Simple Gazpacho is packed with full-on tomato goodness. If you can muster the bravado to bake anything during your pregnancy, you know it's going to be something that's fully fuss-free. Muffins fit the bill nicely, and we love these Oude Kaas and Cumin Muffins. In the Netherlands, we traditionally use boerenkool (curly kale) in boerenkoolstamppot, a ubiquitous yet eternally comforting mashed vegetable dish. Renowned Dutch chef and author Yolanda van der Jagt sautees curly kale with some chili and ginger for an easy vegetable side. Who says you can't have pancakes for dinner? You're pregnant! In fact, in the Netherlands, it's quite the norm to eat pannenkoeken in the afternoon. Hearty pancakes, such as Bacon and Apple Pannenkoeken, are especially popular, but, when you're pregnant, standing in front of a hot stove on swollen feet is not only tedious but can be downright torturous, too. That's why we love this savory take on Dutch baby pancakes - all the oven-baked ease of the Pennsylvania Dutch original with the salty-sweet flavors we fancy. These orange-themed foods will get you through King's Day and beyond. Discover everything about ''ossenworst'', a typical Amsterdam snack. Discover 17 ways to cook with Dutch cheese. Learn More About Traditional Dutch Balkenbrij. Kick Off Your Christmas Menu with Fried Camembert and Cranberry Sauce. Beer. Check. Bacon. Check. Cheese. Check. What Else Is There To Know?